Shorter stays are available last minute. Nightly rates are not reflective of weekly rates. Please contact a reservation specialist for further information. Updated in spring of 2016, Awesome Bayview is tastefully decorated with designer touches throughout. New linens, towels, and outdoor furniture plus fresh paint, decorations, and feel. If you've stayed at Awesome Bayview before, you will already know of the charm found within. With the new updates, you will be coming back to stay again and again. 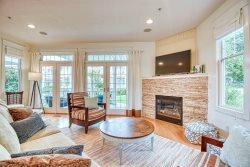 This beautiful two-story condo is situated 'on the hill' in downtown Saugatuck boasting beautiful views of harbor, including the never ending parade of boats and holiday fireworks. Just one block from the SCA and Mason Street Warehouse, you won’t miss any of their many doings. It’s only a hop, a skip, and a jump to fine and casual dining, stores and boutiques of various goods, ice cream parlors, and so much more! Why not take an evening stroll along the boardwalk to check out the many boats that call Saugatuck home? You definitely will not grow bored while staying in this fabulous location! Back at the condo, you can ease the cares of the day away by taking a dip in the association swimming pool. Get in a workout by swimming laps or just cool off in the clear water. If the sand between your toes is more your style, Douglas Beach and Oval Beach are a short drive away. With two spacious bedrooms and 2.5 baths plus additional sleeping in the living room, you’ll have room enough to bring the whole family! Please note the association swimming pool is reserved for owner usage only from 5:00pm - 7:30pm daily. The Bayview swimming pool is open from Memorial Day weekend until the 2nd Monday after Labor Day. Photos on website are not warranted to accurately depict property or property amenities. Property amenities, bedding, furnishings, grounds, parking, layout and other such items may change with out notice. No credits or adjustments can be made for changes of property photos. For any item of particular importance please contact Mill Pond Realty. A non-refundable cancellation fee of 10% applies immediately at the time of reservation. Please be sure of your plans before booking. We love this location and property! Very comfortable, clean and homelike. The condo was a walk to downtown. Quick and easy. Love it! We had a very nice stay at the Awesome Bayview. Location is excellent, views are nice, the condo is clean and decorated beautifully. It was a very quiet and peaceful retreat in a lovely town with friendly people. Thank you!